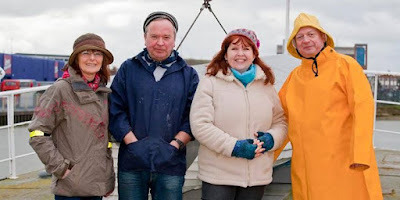 Gill Wilde of Grimsby Jazz recently commissioned Alan Barnes to develop a new work, A Fish Tale, which draws on the rich and interesting history of the fishing trade in Grimsby. Barnes teamed up with guitarist Pat McCarthy and poet Josie Moon and the new work is now about to embark on a tour thanks to the support of Arts Council England. ...the commission explores the myths, the misadventures and the realities of the trawling life. It is a tribute to the contribution made by those in the fishing industry who were instrumental in feeding the nation and protecting it in times of war. It is a powerful and exciting evening of jazz and poetry completely evocative of any fishing port, and guaranteed to stir the memories of fishing communities.